Stony Creek Golf Club, Noblesville, Indiana - Golf course information and reviews. 9/10 - Really like the course, however this summer a miscalculation of herbicide caused loss of grass on some of the greens. Rates have been reduced $5/ per round. Fairways are very nice, rough is a bit tall. Expect the greens to recover for next year. 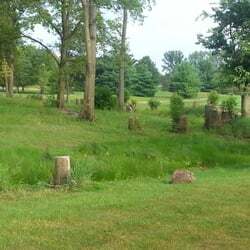 Add a course review for Stony Creek Golf Club. Edit/Delete course review for Stony Creek Golf Club.